The photograph I am about to present to you has not been doctored in any way and is absolutely the truth. There is no way a person like me would lie about a person like John. I know what you’re thinking. “Unicorns! I love unicorns!” I hate to be the bearer of bad news, but I can only wish to myself that John was spending secret time with unicorns. Unfortunately, it is the complete opposite. Wait, no that’s not right. I meant to say Edward “Salad-Man” Cullen. That’s right! 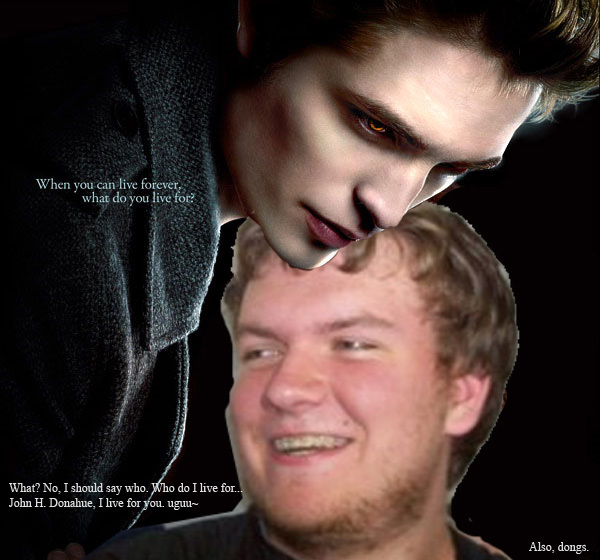 The John Donahue who you thought absolutely denied enjoying Twilight has been spending secret time admiring what John calls the “perfectly chiseled vampire cheekbones” of Edward “Stalkin’-Man” Cullen. I know what you’re thinking. “John? And Edward ‘Egg Crack’r’ Cullen? There’s no way! I thought John loved ‘da ladies. '” It surprised me as well, but photographs do not lie and the photograph I am about to show you will prove my claims. Without further ado, I give you the aforementioned “undeniable proof” as it were. I would warn you that small children may find this highly offensive and should be instructed to look away. You see now, the hypocrisy that is seething out of John’s pores is palpable. You think he hates Twilight? To the contrary my enlightened friend, he absolutely adores Twilight. Well, sort of. You see, it seems that John’s affair with Edward “Lite Brite” Cullen has created an awkward love triangle between John, Bella, and Edward “Nega-Man” Cullen. I know what you’re thinking. “Methinks thou dost protest too much.” I agree, and as such this is even further proof. The likelihood of this rumor being true? 582.33% repeating. John’s “late-night escapades” with the sparklin’ spazman himself have, fortunately for the future of the “Jamison Trumpet Times”,brought about a new line of questions. The first being whether or not John appreciates the sparkling nature of Edward “Doubles-As-A-Vegas-Light-Show” Cullen. Does John even see this sparkling behemoth during the day? Evidence of such hasn’t been found, but thanks to our research department we are working hard to find evidence on that matter. The second question that is brought up is now that John’s secret has been exposed, will he admit that he has been found out or will he viciously deny the blatant truth before us all. We speculate that John will deny all claims that he has been discovered and will threaten to light many a person on fire. Will he set you on fire? It’s possible, after all the vibrant and shining lights from the fire may remind him most of his precious Edward “What’s-My-Line-Again?” Cullen. As we wrap up this shocking development of John and his deep dark sparkling secrets, we must warn all readers that if you are to bring up this subject with John be prepared to have many a word sworn at you and many a fist threatened to your person. We advise that all people ready to bring up the topic with him should bring a picture of his nighttime sweetheart, Edward “What’s-Character-Development” Cullen. The chiseled cheekbones of the one he admires most may calm him down and make him a docile, innocent creature.